The 1957 Red Sox improved to third place in the American League, trailing the pennant-winning Yankees and the second-place Chicago White Sox. Apparently Sullivan’s winter training with the Celtics was offset by his time on the banquet circuit, as his personal win total held at 14. That win total ranked seventh in the American League, and his complete-game total of 14 ranked fourth. His ERA of 2.73, fifth in the league, topped the Red Sox staff that year, and his 240⅔ innings pitched led the team as well. The ERA figure was helped by the three shutouts he recorded in 1957, matching the mark he’d posted in both ’54 and ’55. Sullivan rebounded nicely for the Twins, going 4-1 in 21 relief appearances during the balance of the 1962 season. His tenure with the Twins started magnificently. He did not allow an earned run until his sixth appearance, a streak of 12⅓ innings. His ERA remained below 1.00 until he gave up five earned runs in an inning of work against his old mates, the Red Sox. In November 2008, Frank Sullivan was inducted into the Red Sox Hall of Fame at a ceremony in Boston. In 2009, his book Life Is More than Nine Innings was published by Editions Limited of Honolulu. Unlike many former ballplayers who can be hard to reach, Sullivan enjoys corresponding with people about baseball and would be pleased to receive e-mail. “We leave the dock at 6:30 AM on this Sunday, December 10, 2000, which is the same time we have been leaving it for 20 years in one boat or another. As usual, I am busy helping out with the different chores required for departure. As we leave the harbor still in the dark, I can feel the heave of the boat, and here on Kauai, the moment you leave the harbor you can get a real read on what the day will be like. When we push out past the headlands, it is obvious that we are going to be treated to an incredible sunrise. I can’t help reflecting that this sun that is rising so beautifully for me has just set on the life of my friend and teammate, Willard Nixon. I go down to the back deck and sit on one of the fish boxes alone and I don’t deny crying. Here I am watching one of the most glorious sunrises while alive and healthy, and Willard’s luck has just run out. 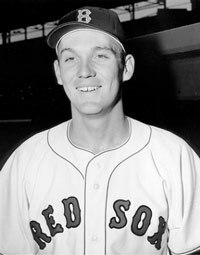 Frank Sullivan started 201 games for the Boston Red Sox and he completed 72 of those starts. But in this case, we are going to use him as the closer. “Simply put, I’ve had a hell of a good life. I’ve seen Niagara Falls bathed in floodlights and been to the Rock Islands of Palau. Watched the sunset in the lee of Niihau and pitched in a major league All-Star Game. I sat in the company of Joe DiMaggio to hear Sinatra sing with the Tommy Dorsey Band at the Palladium and drank with Ralph Evenrude on his yacht. Been to the rain gauge at the wettest spot on earth and watched Ted Williams hit his last home run in his last at-bat in Fenway Park. I’ve been to Hatchet Bay, Eleuthra, and taken the tube in London. Attended the Masters Golf Tournament in Augusta and flown to Kwajalein. Seen the Rock of Gibraltar and had my picture taken with Ed Sullivan. My hometown honored me with a parade and I got paid to play ball in Mexico. Frank Sullivan can write as well as he pitched. And as the record shows, he was a very fine pitcher. This chapter was originally published in the book Red Sox Baseball in the Days of Ike and Elvis (SABR, 2012); to order a copy of this book click here. Frank Sullivan was a great pitcher, a great basketball player, and a Korean War Veteran. But above all else, he’s a great husband and father, and funny as hell. It’s been a privilege and pleasure being his friend for 25 years. And frank was a good friend and a brilliant athlete at. Burbank High School during the war years. He lived on Fairmount Rd a few houses from us. His sense of humor and inevitable smile made him a favorite among our student body. Great article! While Frank Sullivan played before my time, I knew who he was (at least statistically). However, to learn more about the man, himself, was an enlightening story. I always enjoy getting to know more about a player than just what he did on the field, especially for those who played before I was watching. Thanks for sharing this with all of us.